We don’t really know what Mahler was referring to, but the audience is presented with a plethora of persistent riddles when contemplating and experiencing the music of his so called middle period, 1901 – 1905, which encompasses his 5th – 7th symphonies, the Five Rückert Lieder, and Kindertotenlieder (Songs on Dead Children). Stylistically, the symphonies differ greatly from earlier ones and lack the use of voices. Atmospherically, the symphonies and lieder are darker, even tragic, yet they were composed during perhaps the happiest period of his life and career. Compositionally, Mahler’s symphonic structure ranges broadly, from the classic fourmovement Sixth, to the Fifth with five movements grouped into three parts, and the five-movement Seventh with its downright spooky scherzo flanked by two movements of “Night Music”. Compounding these is Mahler’s reversal of the second and third movements of the Sixth Symphony and his wife Alma’s later assertion that he intended to undo the reversal, leaving scholars to debate over what he truly wantedi. And there are the “blows of fate” in the finale of the Sixth. Upon completing it, Mahler added five strong percussive “blows”, later reducing them to three. He said they were “three blows of fate” which ultimately destroy the “hero”. He later removed the third! But perhaps the most tantalizing of all, these works appear autobiographical, but not in the usual sense. The Sixth Symphony and lieder appear to have predicted Mahler’s fateful future. Find out more during MahlerFest week May 12 – May 18. Symposium on Saturday May 17 on the CU Boulder campus. Join us! 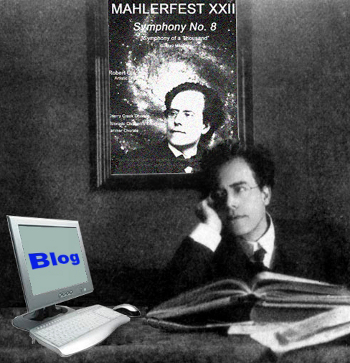 This entry was posted in MahlerFest, Ron Nadel, Uncategorized and tagged Classical music, Colorado MahlerFest, Gustav Mahler, Mahler, Ron Nadel, Tragic Symphony. Bookmark the permalink.